Kariwak is a great place for small, intimate workshops and retreats. We are happy to work with you to plan your next meeting, retreat or special event with a variety of catering and accommodation packages tailored to meet your needs. Email tanya@kariwak.com for more detailed info. Our iconic main Ajoupa is a very special 1000 square foot organic space that was created for quiet reflection and intimate gatherings. This unique, octagonal, open air structure with its golden teak floors and soaring thatched roof is surrounded by gardens, lively birdsong and bubbling goldfish ponds. It’s opening auspiciously coincided with the Dalai Lama’s visit to Trinidad and Tobago in 1998 and in a fortuitous twist of fate, his lecture here was the first event held in this beautiful barefoot space. 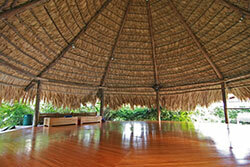 It is the venue of choice for yoga, qiqong, meditation, story circles, poetry readings and small ceremonies. The back Ajoupa, with one long back wall and three open sides, provides the perfect mix of inside and outside space for creative retreats, interactive workshops and small social events. It is thatched in the traditional rectangular ‘longhouse’ style with a tiled floor and a capacity for up to 50 persons seated theatre style or 30 boardroom style. This east facing, 600 square foot space and the surrounding lawn and garden area has been used for everything from sculpture exhibitions to intimate sunset concerts and even a few cosy, casual in-house weddings. Finally, we also have a smaller, air conditioned conference room just off the main dining room is perfect for meetings and presentations. This octagonal space can accommodate up to 15 people boardroom style or up to 30 people theatre style. This is a particularly popular venue for corporate events with our proximity to the airport making it very convenient for participants or facilitators to commute from Trinidad for the day. When not reserved for a group, this space functions as our library and television room.